April has been a long and cold month here in Alberta. The snow has hung on in locations and often during the month new snowfall added to the wet conditions. 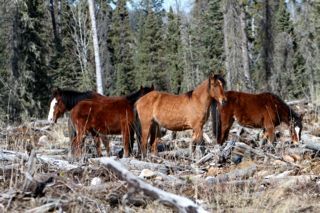 Many back roads are not in very condition as I travel through wild horse country checking on the herds. 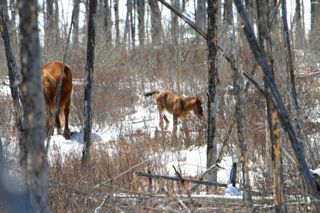 This time I just wanted to bring you up to date on a couple of the foals we reported on last time. 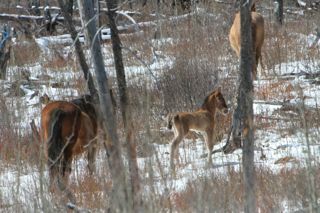 The last time we saw this little filly it was snowing, so cold and it had just been born hours before. Here it is now a week old, much stronger and beginning to explore on its own. The ability of this young one to survive such a harsh environment shows the resilience of the wild horses even at this tender age. This is the other foal that we reported on last time and we’ve identified it as a colt. As you can see he too is doing exceptionally well. Being a few days older, he is much more adventuresome and loves to run around kicking up its heels. He is not afraid to wander away from mom a bit to taste new things that he finds. The whole time he is exploring, mom is busy building up her body reserves again to ensure a good milk supply for her offspring. Even though the mare appeared not to be paying attention to her young one, she is. Here the stallion of the herd has approached in a manner she did not appreciate. She moves in front of her baby, flattens her ears back and lets him know he is too close. Over the years that I have been observing wild horse behaviour, this is one that continually amazes me as I continue to learn about their herd dynamics. 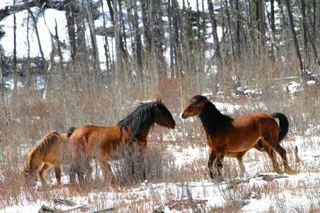 The stallion has his place in the herd, which is to protect them, but he still has to mind himself around the new foals. As we continued on our travels this day, we came across other herds where the mares appear to be so close to foaling as you can see by this beautiful young mare. She is so gorgeous and in such good shape considering the time of year. The likelihood of her having a healthy foal is strong. 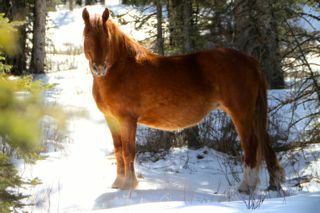 I can hardly wait to visit her herd again to see the foal when it is born because the sire is Napashini. This is the stallion, Napashini, a young boy we have watched grow and mature from the very beginning. His sire is the magnificent Raven. Again this day road conditions dictated where we could explore to locate the different herds that we know about. Many of the herds we could see in the distance but could not get close enough to find out if they had new foals with them. Although our day out there was not that long because of this, as we were leaving we came across Tahatan’s herd. 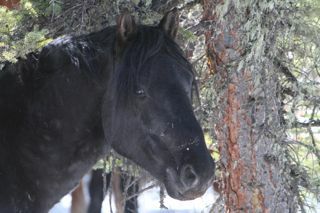 One of his beautiful mares had a new foal with her. 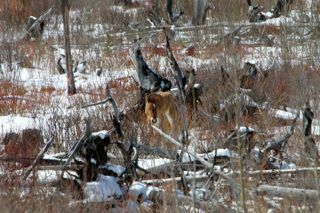 Here the snow was almost gone, the sun was warm and the whole herd was enjoying the easy pickings in this meadow. 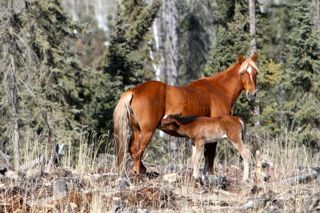 Keeping a watchful eye on us, mom was still calm enough to allow the foal to nurse. As soon as it finished, it laid down to rest. What a great way to end our day.